After trying to install Windows 10 via Boot Camp, my Mac automatically rebooted (supposedly to the newly created Windows partition). However, it just booted back my OS X 10.11.2. How do I recover this missing partition/disk space? The GUID partition table looks good. Nothing is really missing. The partition with the index number 2 is a CoreStorage Logical Volume Group. The partition with the index number 3 is your Recovery HD. The Boot Camp Assistant probably failed to resize the LVG (~ 250 GB) but succeeded resizing the Logical Volume (Macintosh HD ~ 192 GB). As a result about 58 GB in the CoreStorage LVG are not allocated to Logical Volumes. Enter diskutil cs resizeVolume lvUUID size. lvUUID is the UUID of the Logical Volume; usually it's the last listed in the output of diskutil cs list. Use 250g as size. If you get an error (not enough space...) use a slightly smaller size like 249500m. Enter exit, quit Terminal and reboot to your main volume. 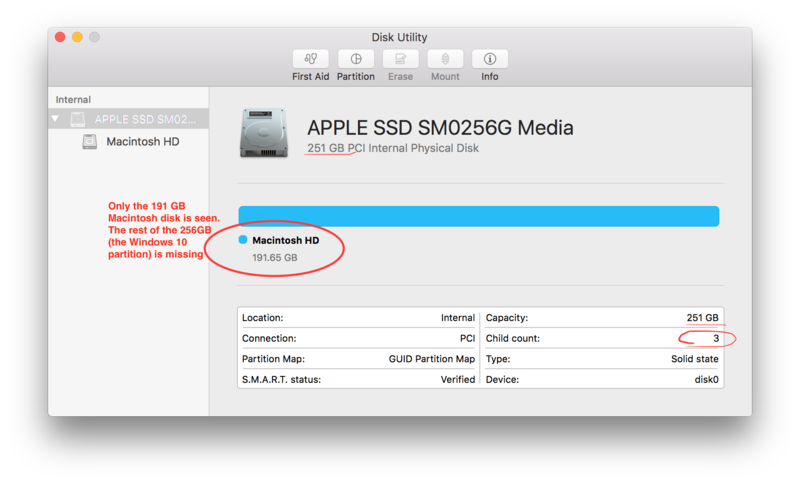 Is this fun partition mess I have made fixable on the Mac OS X side? How do I restore my missing partition and install Windows 7 64-bit?